Are you ready to build your ultimate workspace? 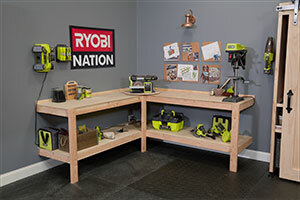 The Ryobi Nation Dream Workshop has fast and fun designs to save space, enable you to build and assemble quickly, plus add endless amounts of storage and organization to your workshop. 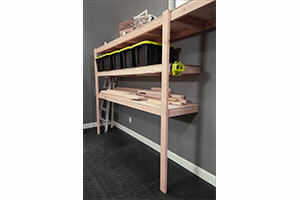 Build one or more of these projects, and then share what you’ve built with the rest of Ryobi Nation. We’d love to see how your Dream Workshop came together! Built-in shelves are the perfect solution to save space and create the right spot for your materials. 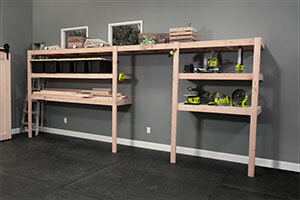 With a few 2x4’s and halve sheets of plywood, you’ll have masterfully built, durable shelves ready to use for years to come. Plus, we’ve built our shelves with lots of space underneath for all of your storage carts. Our incredibly functional storage carts serve a multitude of purposes. 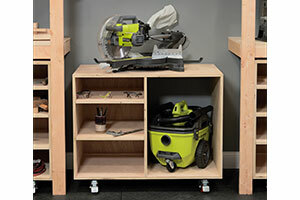 The miter saw cart is not only a convenient and portable home for your saw, but it also works alongside the in-feed/out-feed carts to accommodate cutting long material. 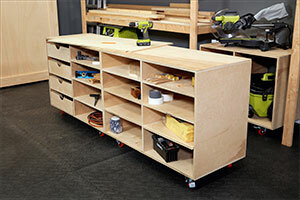 Shelves and optional drawers make this cart a must-have for the shop. Our incredibly functional storage carts serve a multitude of purposes. 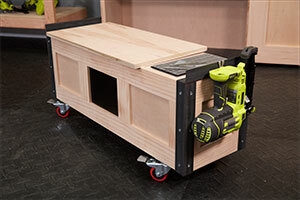 This cart is specifically designed as a home for your table saw and to match up perfectly to the height of the in-feed / out-feed cart. 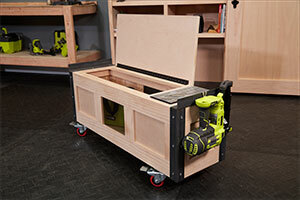 So, you have a portable cart for your saw and a safe way to support large materials you cut. Our incredibly functional storage carts serve a multitude of purposes. 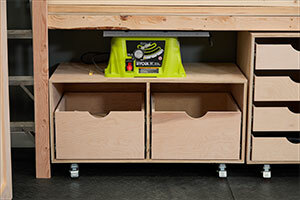 In addition to having shelves and optional drawers for storage, this cart serves as a work surface and in-feed and out-feed support for large materials being cut on your table saw or miter saw. For easy clean-up and maximum convenience, the carts are portable. Place them where you need them, and then put them away. 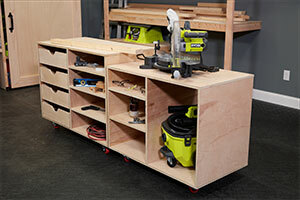 Using basic materials, you can put this great-looking, functional cabinet together quickly and easily. 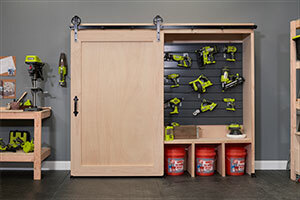 On one side is a simple slat system that allows you to customize your tools any way you want them. On the other side, the “play side”, is a home for your electronics and additional storage. 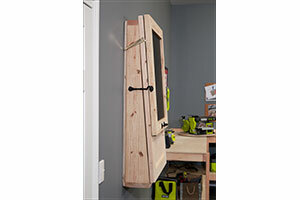 Plus, sliding doors close easily, so when you’re building, your valuables don’t get dusty! This project makes great use of your corner space, with a twist. 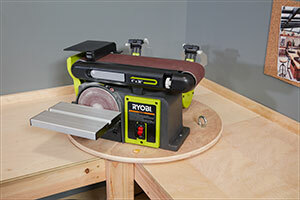 We built a rugged corner table and added a Lazy Susan for easy access to benchtop tools. You can customize the Lazy Susan size to fit the tools you, giving you the versatility without the heavy lifting. 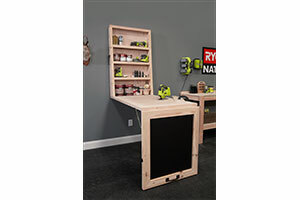 Our easy-to-build plywood and pine Job Buddy makes life a lot easier if you are working down low or need to catch a seat in the shop. With built-in tool hangers and a magnetic tray, interior storage for your phone and anything else you want to tuck away, it will quickly become a handy helper. Everybody needs a Job Buddy! Need a worktable but don’t have the dedicated floor space? 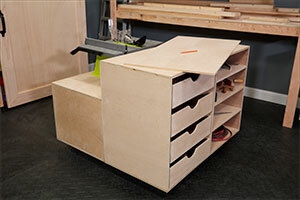 This sturdily constructed worktable folds away (just like a Murphy Bed) for easy storage. It looks great on the wall, even as a home to your chalkboard lists and plans. Just flip it down from the top when you’re ready to build or need to access items on the inside shelves. 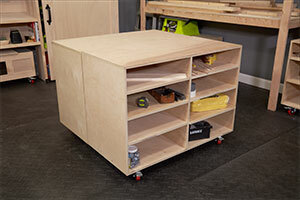 This worktable could be useful in many areas of your shop or home.